At a time when everyone is raging about bugs in another game, ArenaNet is trying to get everyone talking about bugs in its own Guild Wars 2. In this case, it’s for good reason. The bugs in question are the roller beetle mounts I loved so much back in July, and tomorrow Guild Wars 2 is launching five tracks as a part of a month-long sweepstakes in which players can race those beetles for a bit of fame, glory, and best of all, a pile of real-world prizes. If you’re especially lucky when the “Roller Beetle Racing” events wraps up on December 24, you’ll may even drive home with a 2019 Volkswagen Beetle. You don’t even have to race if you want to get in on the fun, as we’re teaming up with ArenaNet to give away two of Razer’s new Nari Ultimate headsets. We absolutely loved them when we reviewed them in September, and we’d like to get them on your heads. As for the courses themselves, ArenaNet invited PCWorld to introduce the “Infernal Leap” track, which sends players careening into the spicy guts of the volcanic Mount Maelstrom. The track starts off quietly enough, with players racing through checkpoints and past enemy NPCs who seem as oblivious to the action as armadillos on Texas roads. But the action quickly heats up. After one swift turn, players find themselves racing through lava tubes so narrow and tortuous that it’s impossible to make it through them while speeding like a fastball. But excessive caution is discouraged: Not long after, players need to build enough speed to leap across the pool of molten lava at the mountain’s heart. In an email, team lead Joe Kimmes tells me they planned the entire track around this jump: “The idea of a jump over the central lava chamber felt like a classic leap-over-burning-cars stunt moment." 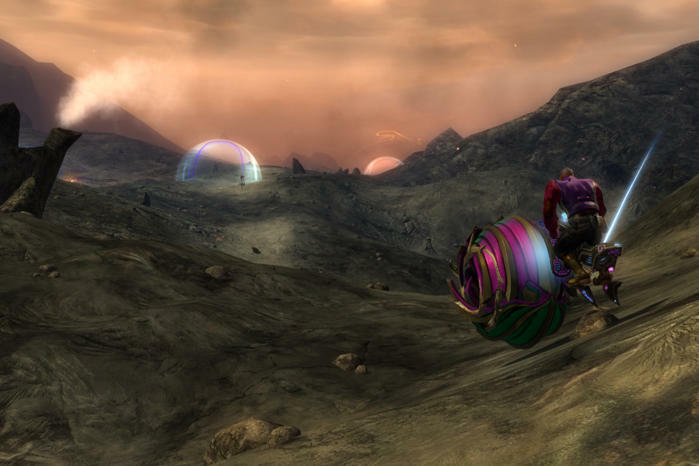 As with the other tracks, ArenaNet built the Infernal Leap course around preexisting settings in Guild Wars 2, so Kimmes and his team had to race their roller beetles around the zone several times before settling on a route that wouldn’t leave players grinding to a halt. This surprised me a bit, frankly, as I was expecting all kinds of crazy bespoke leaps and obstacles when ArenaNet first told me about the tracks. I’m especially surprised that there’s not at least one flaming hoop. Even Fortnite has that. At one point, Kimmes tells me, the Infernal Leap track was far more dangerous. Mount Maelstrom is normally the setting of a dynamic event for regular foot-bound players, and the volcano erupts if players fail. “The decreased vision and heat damage in the core became so great that it was impossible to make it through on the beetle,” he says. 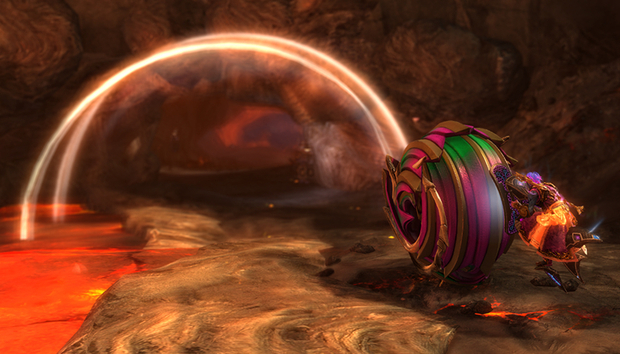 In response, ArenaNet added a limited immunity buff for players participating in the races. The weekly prizes are almost as enticing. They’re so good, in fact, that I’m having a problem deciding which one I like more. There’s the “Razer PC Package,” for instance, which includes a Razer BlackWidow Elite keyboard, a Kraken Tournament Edition headset, a Naga Trinity mouse, and a Goliathus Extended Chroma mouse mat. But there’s also a Alienware Aurora PC, which also comes with a monitor. Beyond that, you can win a home entertainment system—the details are currently scant—or a vacation to San Diego that includes some time careening through the sand in a dune buggy. To enter, players simply need to sign up through this link and enter at least one roller beetle race between tomorrow and December 24. Each weekly race earns you another ticket for both the weekly prizes and the grand prize, giving you four total chances to win. ArenaNet is making sure as many people as possible can get in on the fun, as the event won’t require the Path of Fire expansion or even the the unlocked ability to use a roller beetle in the wider world. Simply saunter up to one of the race tracks, and the NPCs will let you rent one without paying for the current content until January 7. You’ll still have to buy the game itself in order to play, but ArenaNet is currently selling both the standard and deluxe editions of Guild Wars 2: Path of Fire for 50 percent off when you enter the code BlackFriday50 at checkout on its siteRemove non-product link. Events like this are among the reasons why I still admire Guild Wars 2. Few other MMOs dare to be so creative in their game design, and that’s a legacy that goes all the way back to 2012 when ArenaNet entranced us with dynamic events that broke free of EverQuest-style quest design. The roller beetles themselves elevate the usual humdrum MMORPG mounts into something skillful and exciting: They drift, they gain momentum, and sometimes they even smash through barriers. Mounts in World of Warcraft, by contrast, feel barely different from walking. I'm digging this Mission to Mars reboot. That skill cap means you’ll need to stay alert to win the Infernal Leap. Kimmes advises keeping an eye on the next checkpoint so as not to miss the hairpin left turn that appears not long after the central lava chamber. It’s easy to get distracted by the NPCs, he says, which could cause you to miss the turn and lose precious time while turning around. Sounds tough. But with so many prizes on the table, there’s plenty of reason to practice.